So on a whim, dare or agreement on a comment on someone else’s blog, I had signed up for Improv 101 classes at the UCB Training Center. We pretty much mimicked “Whose Line…” with a certain degree of success, especially since on TV they get to edit and only do 22 minutes with tons of commercials. We did a solid two hours! I sat behind the desk and participated less. It was a much “safer” position to take, so if everything went wrong (and sometimes it did) I’d be “in the clear”. So now I find myself under fire – to drop preconceived notions and to try to break through any doubts, layers of protective psychological mess, and in the great words of some Nike marketing person – Just Do It. One of the requirements for the class is to attend at least two improv shows, in order to get an idea of what the format looks like when more experienced players go at it. I’ve been to ten already. It’s a great learning experience – in both what to do and what not – and we will get a chance to re-hash some of the performances at the beginning of class on Wednesday. So I’ve got me a little notebook, to jot down observations during the show – in some attempt to use this as study material and analyze this to help me get better. I think I’ve found the calling. I got to be four feet away from some icons in comedy on Sunday night and watched them play (perform) with each other. Amy Poehler, Horatio Sanz, Seth Meyers, Rachel Dratch (who arrived late and made a great game out of that), Jack McBrayer, John Lutz, and more than I can remember. The guest monologist was Alan Zweibel, from the first days of SNL, and he regaled us with some stories of life back then, how it was and what it was all about. And how Gilda Radner tossed a brunch-plate-laden Woody Allen off a step at a party just to make Alan laugh. Even though the format may not be as “strict” as what I am learning, it’s still amazing fun to see a bunch of people get out there and just have fun. One of the oddest things happened today. I went to the gym – and to those of you jumping up, no, that was not the odd thing – and as usual, when I leave the house, I lock both locks, and drop the keys into a very small inside pocket in my jacket. After my workout, I gear back up and head home, and when I reach the front door, I go for my keychain (it’s a cool black one, a great present from my man Dan!) and notice that one of the keys is missing. Odd. I dig deep into the little pocket and find the missing key. How does a key “escape” the confines of a circular metal ring? Posted on February 18, 2008 Categories Interesting Junk, PersonalLeave a comment on Supernatural in my pocket! So I don’t usually do any kind of prouct reviews, and tell you what I’ve bought, but this one takes the cake. As some of you may know, I’m incredibly lazy. In fact, so lazy that the idea of having to look for the remote corresponding to the activity I’m looking for tires my mental faculties. You have a TV remote, that does the cool functions that your awesome TV can do. You have a cable/satellite set-top box that has all sorts of specialized functions, particular to your provider. You may have a DVD-player, gaming console of some sort, and more (I have an XBox 360). So having all these remotes and controllers gets annoying, and your couch side coffee table gets cluttered, and you have to find the remote you want whenever you want something, and then the TV needs a screen tweak, so you have to find THAT remote, etc. 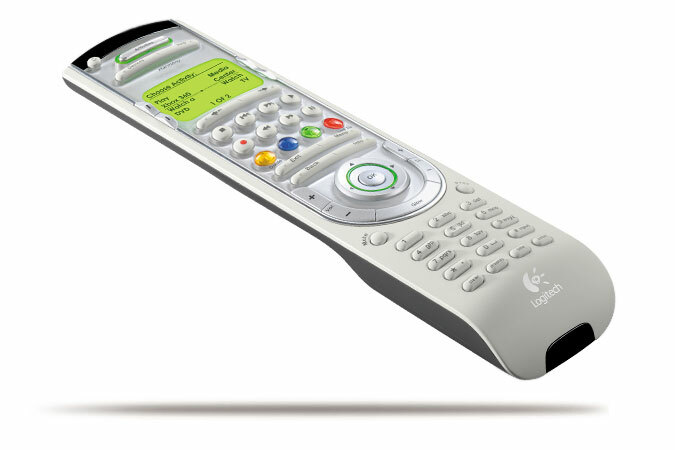 Some remotes offer a little cross-functionality, for example: my cable box remote can be programmed to use the basic (power, volume, mute) functions of my TV. But not everything. So the people over at Logitech have probably figured out that I exist, and so do many others like me, and created a whole line of remotes under the branding of Harmony remotes. That’s cool. And they went one step further and made a special one for my Xbox 360. I bought it for a great price of $79.99 at J&R, and it took me less than 20 minutes to pop in the software CD, for it to update itself and the remote with upgrades, and download device profile lists off the ‘Net. The guide was nice and simple, and walked me through a simple series of questions and answers, that I believe anyone of any technical ability could do. Then it took my devices and made a list of typical activities that I might use the devices for and built “Activities” – which run multiple commands, such as “turn on TV, set to Channel X and turn on set top box” all with one click. Nice and simple. It works surprisingly well, and I just put all other remotes into the drawer for now. Hopefully I’ll forget that they are there! It’s odd, you see, that while looking for 24-hour diners/coffee shops in my neighborhood, I came across this site. What’s even odder that I couldn’t resist answering the questions. And even odder is that I’m kinda proud of the results. So how many can YOU take? So today was the first day I actually tried to deal with food. Last night, after the gym, I went shopping, and bought some yummy-looking, low-fat stuff and planned for three days worth of eating breakfast, dinner and two small snacks. Lunch is typically a fresh salad with a bit of lite dressing from somewhere around the office, or some steamed vegetables over brown rice at the Chinese restaurant in the area. I actually had to force myself to eat breakfast, as it’s not something I normally do – the morning is more of a “get out the door” time, or “check your emails” time, but not really a sit down and eat time. I then snacked on a little lite sandwich at around 11, and ate a late salad lunch at 2:30. Afternoon snack was a yummy Nature Valley bar, and for dinner I used the oven – not the microwave! Finally! – to heat up a more-than-delicious dinner from Amy’s Kitchen. While it was heating, I got to preparing a simple mixed lettuce, red pepper, tomato and radish salad – and I had forgotten how simple and delicious that can be. So dinner has me completely filled to the gills – not hungry at all – in fact feel a little stuffed – in a fairly low caloric content for the day. That’s what I call a good day’s eating. So let’s see how this plays out – especially since I have a workout early tomorrow morning. Sitting down today to read through my endless RSS feeds – I have a bunch, don’t you? – with my trusty, always there wherever I may be, Google Reader, I thought about the time I invest in reading others words in relation to mine own. I don’t write enough. I’ll attempt to rectify this with trying to convert the mind-numbing television viewing time with creative, semi-productive time. Why only semi-productive, you ask? (See, I can read your thoughts already!) Well, if it was fully productive time, then there presumably would be some sort of end product, whereas all that ever gets produced is are 0’s and 1’s, that is some sort of combination make up bits and bytes, which then come together to form words and possibly express thoughts or whatnot. So if all it is is a bunch of zeroes and ones, what really does it amount to? Earlier tonight I had an experience I never thought about, and if asked, I’d probably have replied with, “That would be cool, but not on the top ten list.” That statement would be hard pressed to provide said list, as there isn’t one at the moment, and probably never will be, as I’m lazy that way. If there’s a list, and it has items that are on it that aren’t checked off, then there’s potential for them to never be checked off, and why not live up to your potential, as I was always taught – yet rarely practiced. A vendor that my company works with – and pays well for their superb product and services – hosted a nice evening of after work drinks and snacks at the New York Stock Exchange trading floor, right here, a few blocks from my place, on Broad Street (the entrance is not on Wall Street, as common misconception would have it). This was in response to their being bestowed the honor of the following morning’s “Ringing of the Bell” – a 9:30am wak-up call for the market, which begins the trading. Once a mundane, boring aspect of some guy’s job, now an honorarium. Security was tight, as it always is, and you have to be on the list to get through the front door, after which metal is unfairly discriminated against by means of gateways that will beep angrily if you have any on your person. Greeted by vendor representatives, and escorted along the way by ushers, you finally step out on to the trading floor. Now we’re not talking about a nice little hall, that people mill around and chat, but the actual trading floor itself, where the combination of old-school methods and decor are mashed together with an abundance of new-school technology – from touch screens to ticker tape, this place is a sight to look at. High ceilings, clocks and tickers everywhere, phones and computer consoles galore. A lot of them even had Playstation-like controllers hooked up to them – I have absolutely no idea why. Open bar, so I got me a nice scotch on the rocks, and my colleagues and I spent some time walking around, tasting yummy-looking stuff, and spoke to some other visitors about companies and compared some stories. We also had a chance to talk to some vendor representatives, where after we three voiced our appreciation and happiness with their product, I was emboldened by the knowledge that “an unhappy customer is a chance to improve the business via feedback” line of thinking, and voiced a couple of items that I believe they could do better on. This information was met with appreciation, and I am glad that I voiced my thoughts. I usually let the inner monologue go forth, but on those times when restraint is prudent, it’s good to know that some of the inner can be outer and do well as such. In any case, it was pretty cool, and I got to stroll around a place that has unspeakable amounts of money pour through it daily, affecting millions of people’s lives, and it was quite pleasant. There’s a picture behind here, for the skeptics.